Type species. Scarabaeus subterraneus Linnaeus 1758: 348, by monotypy. Diagnosis. Body length 6.9-7.3 mm, elongate, robust, black. Pronotum with fine and coarse puncture, coarse punctures irregularly distributed and widely scattered. Scutellum large, triangular. Metatibial apical spinules short, equal in length. Distribution. Palearctic; northeastern North America (introduced). Composition. Worldwide, Eupleurus contains 2 species, one of which occurs in the New World. Eupleurus subterraneus (Linnaeus 1758: 348) [Scarabaeus], Palaearctic, introduced in northeastern North America. = Aphodius coerulescens Harold 1861: 103. = Aphodius fuscipennis Mulsant 1842: 171. = Aphodius fuscus Dalla Torre 1879: 106. = Aphodius ruber Dalla Torre 1879: 106. = Aphodius rufus Dalla Torre 1879: 106. = Aphodius subcarpathicus Roubal 1936: 324. = Scarabaeus sulcatus Fabricius 1792: 24. Larvae. The larvae of E. subterraneus is described by Zhang (1984). Gordon, R. D., and P. E. Skelley. 2007. 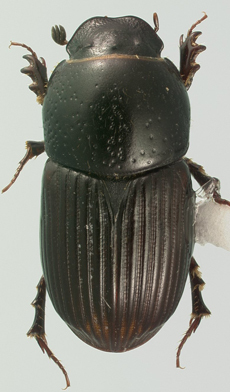 A monograph of the Aphodiini inhabiting the United States and Canada (Coleoptera: Scarabaeidae: Aphodiinae). Memoirs of the American Entomological Institute 79: 580 pp.